It’s easy to see all the ways others should repent. As ISIS beheads and Fifty Shades rakes in millions, it’s tempting to feel at best defeated, and at worst, morally superior. But God, as we begin a season of reflecting, remembering and begging for your mercy, as we walk with Jesus toward the cross, will you please show us the ways our sins nailed you to that place? Will you please show me my sins? Jesus, please open my eyes to the areas I choose blindness so I can avoid action. Make me aware of the emptiness of all of my excuses. And even in that place of repentance, please give me a new understanding of what it means that you went first. You took on sin, pain, suffering and death so that I could have hope – even in my insistence on doing things my way. Jesus, help me make much of you in the coming days and so much less of myself. Please give me the strength to take up my cross and follow you. Two weeks ago my husband called me at 1:30 to see if I had eaten lunch yet. I had, but he continued to pester me anyway. He even tried to talk me into a “second lunch” complete with a milkshake. I was busy, trying to cross things off my ever-important to-do list so I blew him off. Then he played the trump card, “What about a lunch date with me and Jacob?” he asked. Jacob is our 5-yr old son who is in kindergarten. “What? !” I yelled into my phone. “Tell me you didn’t pick up Jake early from school?” I cried. My heart should have melted. I should have been so proud to be married to that man in that moment. But the smart part of my brain hadn’t caught up to the busy part of my brain yet, so instead I told him that I wished he would have consulted me (yes, I said “consulted” as though we were a business or legal firm instead of a family) and I would see them at home after they finished their milkshakes. I had stuff to do. I can’t believe I’m telling the internet about this. 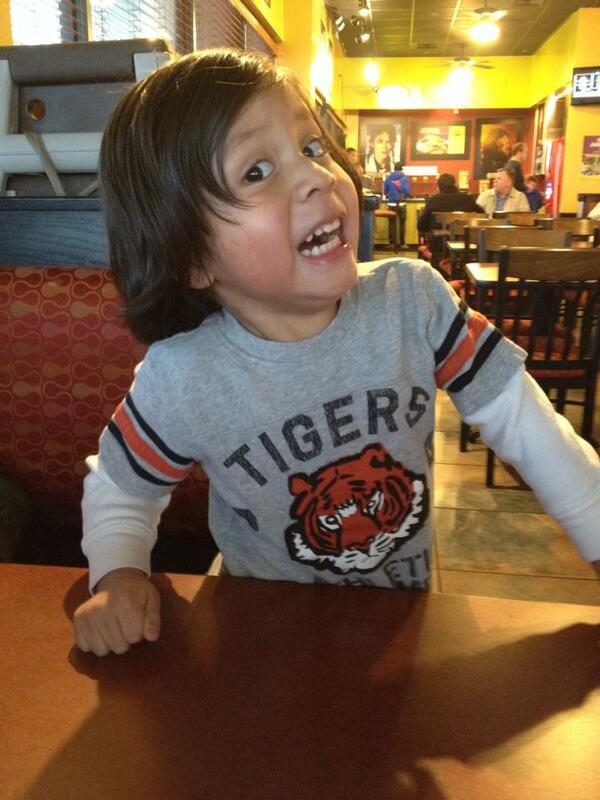 My son’s face when his dad walked in the room…the image eventually sunk in. There are so many moments of our kid’s childhoods that we will forget and they will forget, but I’m pretty sure they will remember the moments we showed up. They will remember the times we showed up for “no reason” except the reason that’s the very best – just because we wanted to see them. It works in reverse too. I can think of several frustrating days that were turned around completely by a visit from my boys, my husband, my parents or a friend. There was one time in particular when I was under water and my sister took time away from work and her family to fly from Ohio to South Carolina and help me get back on my feet. In three days, she took me out for a girl’s night, had my house cleaned, and filled my freezer with 14 crockpot meals – lifesaver doesn’t begin to describe it here, folks! But all of that pales to the simple fact that she showed up. The Bible teaches us that God delights in His children. Can you imagine how God feels when we show up, when we choose time with Him over all of the other things begging for, and often demanding, our attention? I preach often about the fact that we are supposed to be the church, not go to church (we go to worship – I know, semantics). However, it’s equally true, that “we can’t be the church until we go to church” as pointed out by Karl Vaters here. In other words, we need to show up for God and with God. And when we do, we can be confident that there is joy and delight written on His face and imprinted back onto our lives. Can you picture His face? You are His joy and delight, not when you get it all right, but when you show up. My Monday nights are sacred. I spend them with my community group of 11 other women. We laugh – oh, we laugh. It’s the really loud, genuine laughter that has nothing to do with being polite and everything to do with the hysterics of letting loose and being ourselves. We sigh – the deep kind that comes from a place of weariness we don’t need to find words with when we’re together because we all get it after another week of fighting the good fight, working hard at jobs, working hard at home, cleaning up after kids and then doing it all over again (and again and again). Inevitably, tears brim for a few who’ve had a particularly tough week; and when they spill, there are 12 wet faces in the room because women don’t let other women cry alone. We just don’t. Believe me when I tell you our husbands and our families are happy to give us these Monday nights away. As a wise friend told me about a year and a half ago, it’s not fair to ask our husbands to be our girlfriends. We need our mothers and our sisters and our girlfriends to understand the things the men in our life never will. And that’s okay. But there are times like last night when I leave a little bit frustrated because it feels like it shouldn’t be so hard. It’s not that we shouldn’t cry, it’s that we shouldn’t have to cry every week. Life shouldn’t be taking such a heavy toll and wearing itself all over our 20- and 30-something faces. We shouldn’t constantly feel like breaking point is only one more burnt piece of toast away. But the alternative is giving up, and I can’t make myself believe that’s the answer. Maybe life is supposed to be that hard when we’re living it all and not content with getting by. Maybe hard is just par for the course when we’re fighting for the kids in our homes and for all of the kids outside of our homes. Maybe weariness comes when we refuse to live comfortable lives and instead fight for better marriages, better schools, stronger communities, and the list goes on. The truth is I deeply admire the women I sit with on Monday nights, and really all of the courageous women in my life. I am humbled by the fact that I get to see them fighting and sometimes cracking, but then they get back up and keep going. I am grateful to know that when I’m flailing, I’m never flailing alone. We’re better together, and together is when we find out that the “all” we’ve been wanting we’ve really had all along. That’s right, it has taken me two years to get over the loss of cable enough that I can talk about it. Unlike others who have gone before me, I didn’t give up cable without a good measure of kicking and screaming. And I definitely didn’t give it up and instantly realize how much better my life is without it, how much more time my husband and I have to connect, and other nonsense like that. I don’t know what type of countertops everyone in America is getting without HGTV – should I be coveting granite or concrete? I can’t believe I’m reduced to watching Duke basketball games via gamecast? Hmm, it seems awfully convenient that we gave up cable at the end of college football season…Clark and I need to talk about this! I guess it’s obvious we didn’t give up cable because we’re emotionally and psychologically healthy beings who knew it was the right thing to do, but because we needed to work on being slightly healthier emotional and psychological beings – less connected to fictional characters and more connected to real people and real families whose drama isn’t tidy enough to put on tv. No, that’s not true either. We gave it up to save the money. In short, without cable, I learned – finally – that I actually had more time than I had been complaining about not having. I learned that I had never lost my love for reading, but I had given it a backseat to less superior story-telling on a screen. My kids learned that chasing lizards and building habitats of sand buckets and soccer balls is more entertaining than Mickey’s clubhouse…most of the time. And, occasionally, my husband and I do have better conversations that may or may not be attributed to the lack of background noise. I can honestly tell you that it took me at least a year and a half to get over missing cable, but I did…it was right about the time when we got Netflix. Someone recently told me I am “the potpourri of baptisms.” I started to be offended, but then realized they had a point. I have sprinkled, dunked, poured and dedicated people from infants to the elderly. I’ve baptized in the neighborhood pool, the portable pool we set up in the high school auditorium, church sanctuaries, the ocean shoreline and a bucket I dug out of my garage. I’ve worn a robe, jeans and a t-shirt, and a swimming suit with gym shorts – none of those combinations at the same time. I’ve baptized people I’ve known for years and I’ve baptized people I met that same day. We could discuss water temperature, but I think you get the point. The belief that we are not saved by our baptism, but by Christ. The understanding that baptism is a gift of God’s grace that we don’t earn, understand or choose on our own. The presence and power of an awesome God whose grace is at work in the lives of all who share in this sacrament of grace. For too long, we’ve used our traditions and practices of baptism as a dividing line, when Paul specifically says there is “one Lord, one faith, one baptism.” Baptism is a gift of God given in a variety of ways. It is a means of grace, a covenant made with a promise, a Sacrament that ought to unite us in Christ rather than a mere practice that largely reflects our context and the denominational traditions that have formed us. There is one baptism as there is one source of salvation – the gracious love of God. The baptizing of a person, whether as an infant or an adult, is a sign of God’s saving grace. That grace – experienced by us as initiating, enabling, and empowering – is the same for all persons. All stand in need of it. The difference between the baptism of adults and that of infants is that the Christian faith is consciously being professed by an adult who is baptized. A baptized infant comes to profess his or her faith later in life, after having been nurtured and taught by parent(s) or other responsible adults and the community of faith. Infant baptism is the prevailing practice in situations where children are born to believing parents and brought up in Christian homes and communities of faith. Adult baptism is the norm when the Church is in a missionary situation, reaching out to persons in a culture which is indifferent or hostile to the faith. While the baptism of infants is appropriate for Christian families, the increasingly minority status of the Church in contemporary society demands more attention to evangelizing, nurturing, and baptizing adult converts. What was once a theological battle between the practices of infant baptism and believer’s baptism within Christian denominations needs to give way to a culture that demands clarity on the foundation of our faith, which is the declaration of Jesus as Lord. In baptism, we celebrate that in the strangest ways by the most undeserved means possible what God has given us– grace we can’t ever earn and love we can’t fathom. Baptism is the outward and visible sign that we are part of a covenant community formed and enabled by God where we are growing in grace everyday. My belief in baptizing in a variety of ways is not to make less of God (as if Icould) or suggest that it really doesn’t matter how we baptize or what we believe, but instead to make much of God and the fact that God’s grace is something we can’t box or package in any one way. If we are to be a countercultural people who are raising “weird” families in a strange and spiritually confused yet spiritually hungry culture, if we are to be a passionate people determined to not stand alone but instead do as Jesus asked, to “GO and make disciples of all nations, baptizing them in the name of the Father and of the Son and of the Holy Spirit” then we need to be ready to seize every opportunity made available to us to baptize young and old, and celebrate wildly the saving grace of an amazing God. 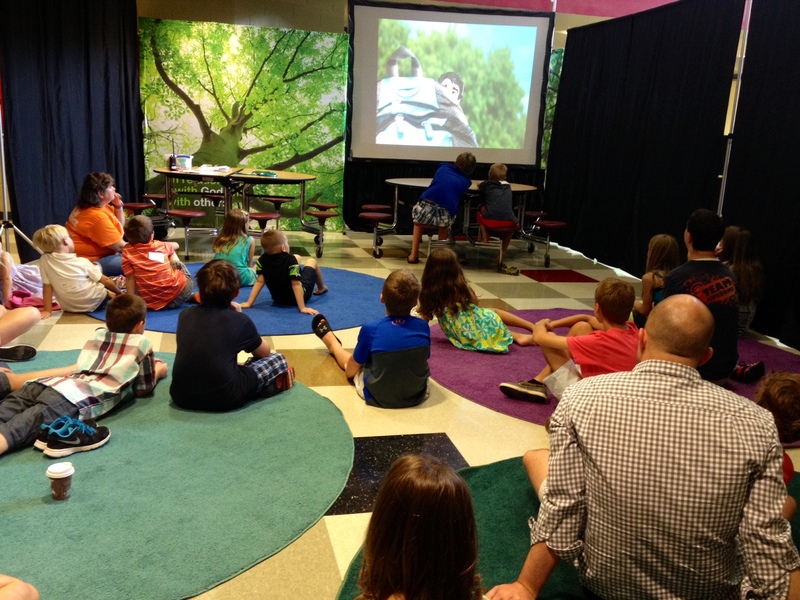 What would an AR Kids blog week be without another great post from our AR Kids Director, Jamie? Check it out, friends! The other night Russ and I had the opportunity to get together with a group of friends that he worked with almost 10 years ago. The plan was for everyone to gather at a restaurant in downtown Charleston just after work. Since we were coming from Summerville, we had our sitter get to the house so we could leave around 4:30. We had eaten a late lunch that day, so I let our sitter know I would order the pizza later so it wouldn’t just sit on the counter until they were ready to eat. I also let her know that if the pizza wasn’t there by 7, there were bagel bites in the freezer. As we left, I asked Russ to help remind me to order that pizza. I’m sure you’ve already figured it out, but we—I—forgot to order the pizza. We got a text from our sitter at 6:55 asking if the pizza was on the way. My head and heart dropped. I texted her back to go ahead with the bagel bites, and to let the kids have two scoops of ice cream tonight—my attempt at an apology and win their grace before I got home. Because, you see, this wasn’t my first time forgetting to order the pizza. I have made that mistake before. This time I at least had a back up plan with the bagel bites. The last time I had to call Russ to run to Little Caesar’s, pick up a $5 pizza, and drop it off. And my daughter would not let me live it down. She always asked if I was sure I ordered the pizza. The sad thing is the app I use would allow me to order the pizza ahead of time and have it delivered later—which I plan to utilize from now on. I just knew I could do it on my own. See, we don’t have it all figured out. Sometimes, we need help. We need each other. And the truth is, when we work together, things usually turn out better. That’s one of our goals with AR Kids. We realize that there’s only so much we can do each Sunday to encourage the growth of your children’s faith in Jesus. We want to partner with you to help you continue the conversation of what we talk about each Sunday with them throughout the week—think about those Parent Cues & God Times we send home with you each week. By working together, each of us doesn’t have to have it all figured out—we never really will. And that’s ok!! We don’t have to know all the answers, but together we can have a greater impact and figure it out! We have had a fun time this week following up with that at home. Jude has learned through his preschool lesson over the last few weeks that God made him. As a result, he has been asking what else God has made. “God made Mama, Papa?” “God made my bowl, Papa?” To which my response was always “Yes”. Occasionally he would follow that up with the traditional four year old retort, “Why?” My answer (because it was the best I could come up with off the top of my head), “Because God loves you.” Every time we would get to this part of this continuous conversation, he would look at me and say, “I love God.” It was cute, heartwarming, and had all the makings of a facebook post, though it never quite made it there – until now. The reality was, Jude didn’t say he loved God on his own. He wasn’t thinking deep or theological about the cross and resurrection. The truth was/is he hasn’t even comprehended a hint of what any of that means. His basis for loving God? Because God made the things that Jude loves. That’s the only reason. Not forgiveness, salvation, or atonement. None of these words even resonate with Jude’s vocabulary. God loving Jude by creating the things that make Jude happy? Now you’re speaking his language. The fact is, that’s the language for all of us. John put it this way, we love because He first loved us. The only reason we love God is because we were “first loved” by God. As adults, we tend to find ourselves in this game of “working” for God’s love instead of enjoying the fact that it’s always there, and has always been there. That’s probably why Jesus told his disciples not to restrict the kids from coming to him, because they get it so much easier than we do. This is why kid’s ministry is such a big deal at Ashley Ridge Church. We know that lots of roadblocks can be avoided on the path to becoming fully committed followers of Jesus if we can begin to instill these truths of God’s love at an early age. The good news is two fold: a) We are reaching lots of kids with this message already, and b) this message really starts to sink deeper if is reinforced at home. With the partnership between church and family, we can together help to raise generation of fully committed and devoted followers of Jesus. So I encourage you to use the Parent Cues at home. Ask questions. Help reinforce at home, what your kids are learning in church. And feel free to email us for a copy of these resources if you miss a week. We’d be happy to serve alongside you in this way. We’re in this together! This summer we welcomed our FABULOUS new AR Kids Director, Jamie Touchberry. 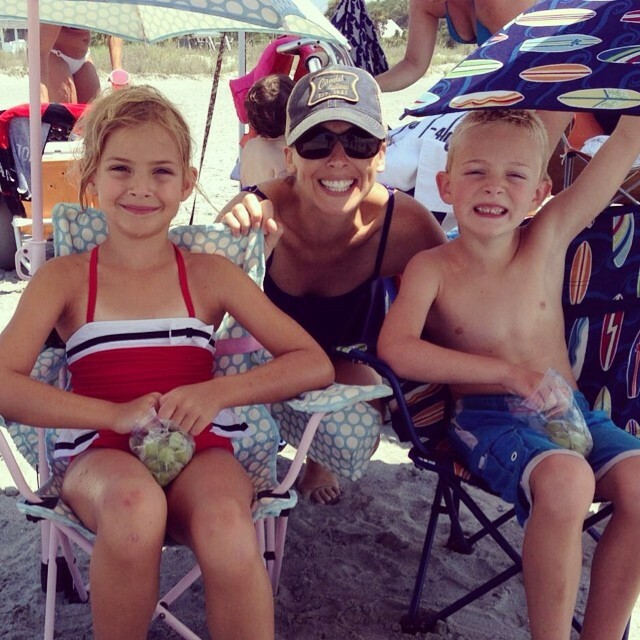 Jamie and her husband, Russ, are Summerville natives and they have two kids, Sage and Beckham. Jamie brings a lot of passion to our team for kid’s ministry, student ministry and outreach. As part of AR Kids blog week, Jamie shares what it looks like to create together. Recently I got the opportunity to have a girls’ night at our local Bottles ‘n Brushes with some friends. When I got there and looked around, I was excited to be able to just relax and be creative that evening! 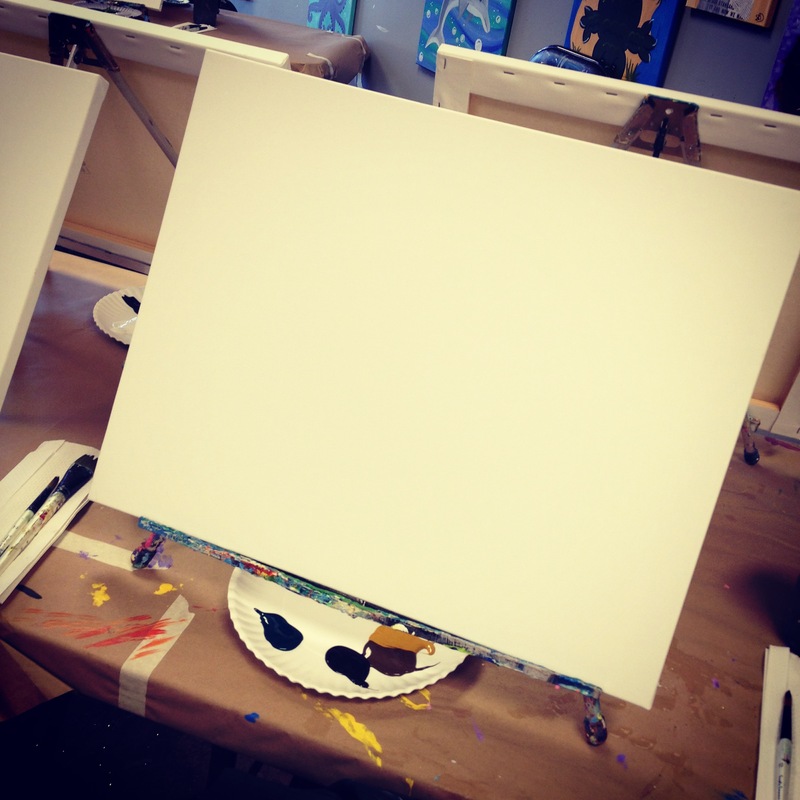 As I waited for the class to start, I stared at the blank canvas in front of me and couldn’t help but think how this is exactly how we start out our lives, pure and clean. As the evening went on, I couldn’t help but to continue to draw comparisons about our lives and my class experience. As the class started, the teaching artist told us which paintbrush to pick up. She proceeded to tell us what colors of paint and how much of each paint to get and mix together for our first color. Then the painting began. She showed us where and how use the color we had just created. She let us know what to do if our color was too light or too dark. Then we moved onto the next step. Again, she told us the colors and approximate amounts of paint to create the next color and where and how to use it. Our artist continued to do this throughout the evening. Step by step she provided us with the guidance we needed to create our little masterpiece. She calmly answered our questions and concerns. She let us know that we couldn’t mess up. That all we had to do was let the paint dry and paint over it. There were some of us that moved quickly and finished as she was doing the last step. There were others—like myself—that had to ask here multiple times to go back a few steps and repeat her instructions because we were a little slower than others. In the end though, each of us had our own little masterpiece to sign our name to. And of course, no one was identical and each one had it’s own special touches. Our lives, who we are, what we stand for begins blank and clear—an empty canvas. As we begin to grow, we have many different teachers –parents, teachers, friends, pastors, and more—that help us put the colors of our lives together. Some of these colors are just right and help move our masterpiece to completion. At other times, our colors—behaviors, choices, experiences—need some adjusting. 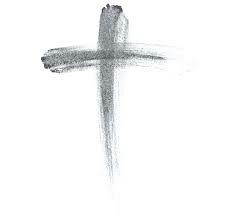 Sometimes we need to just let the paint dry and try again—repentance. Once we are done, at the end of our lives, we are the masterpiece. We are a sum of all the colors—experiences—we have used throughout our lives. Even if we have had to let the paint dry and start over at times, we want to be a masterpiece that Jesus wants to sign his name to. Let’s create a masterpiece together. There are many ways you can help add color to the masterpieces being created by our youngest churchgoers and be part of AR Kids. We have volunteer needs for all different age groups (Nursery—5th grade) and involvement levels. 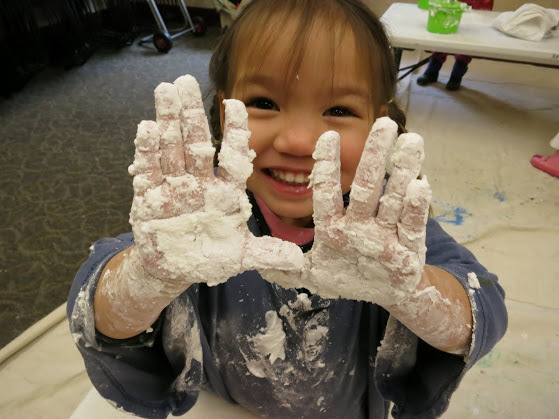 Our nursery kids need you to love on them and start to introduce them to God’s love for them. For our elementary kids (K-5th), there are several different volunteer opportunities. We need volunteers to help with the elementary drop off and pick up times. for a “Volunteer Kids Drop Off Area” where volunteers can drop off their kids while they get their rooms and areas ready for Worship time. Life is better together, and we need your help to add to our youngest churchgoers AR Kids Worship experience! Kids always have them. And by “always,” I mean that in my made-up world of statistics it’s a 100 percent probability that a kid’s hand will be sticky when they go to touch the white couch you never should have bought, or your sunglasses. Or better yet, when they slip that cute little paw inside yours. Even my 5-yr old understands this phenomenon. At dinner time when we hold hands to pray, he shies away from his little brother’s hand knowing he will come away with a little somethin’ extra in the exchange. For some reason, he doesn’t want whatever his brother ate for lunch flavoring his dinner. Kids – we love them because they’re ours. And by ours, I don’t just mean the ones with our DNA or same last name. I mean ALL kids, every sticky-handed last one of them. They are ours to cherish, protect, care for, stretch and nurture into adulthood. They are ours to mentor and coach, love and teach. It is a precious privilege and a steep responsibility. This week we’re gearing up for the start of a new school year with a Kids Blogging Week. All week long we’ll be talking about the beauty and challenge of working with kids. We believe it’s our privilege and opportunity to partner with families to raise kids who love Jesus and love His Church. I hope you’ll join the conversation with us. What are your biggest challenges as a parent, grandparent, teacher or coach? What do you love most about the kids you engage with every week? How do you feel called to more when it comes to leading our kids to Jesus? For more information about the kid’s ministry at Ashley Ridge Church, check out www.facebook.com/AshleyRidgeKids. We need those leaves…now. We need them even more than the leaves of an aloe plant that heal our summer vacation burns. (Are those leaves? What does an aloe plant look like anyway? I digress.) From Israel and Palestine to Russia and the Ukraine and even our own backyards, we need healing. We need a reason to come together. It makes sense that it would be the leaves that hold the healing. Gardens and the plants they inhabit have always brought people together. 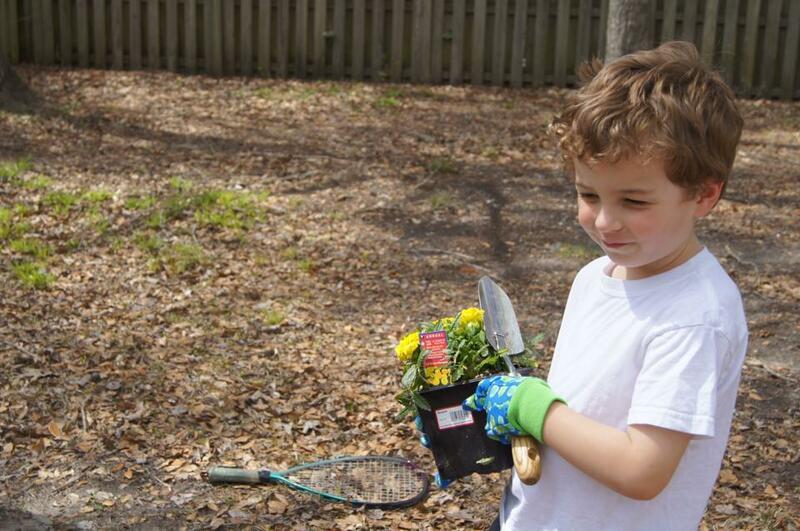 Last year, my son and I planted a garden for the first time with the help of my dad. My thumbs aren’t the greeniest of green, so I needed to enlist some help. Every day we helped each other remember to water the plants, and together, we watched the leaves grow and vegetables form. And eventually, the best part came. We ate. Juice ran down our chins and we laughed, and we felt proud that we had been part of making something grow – together. 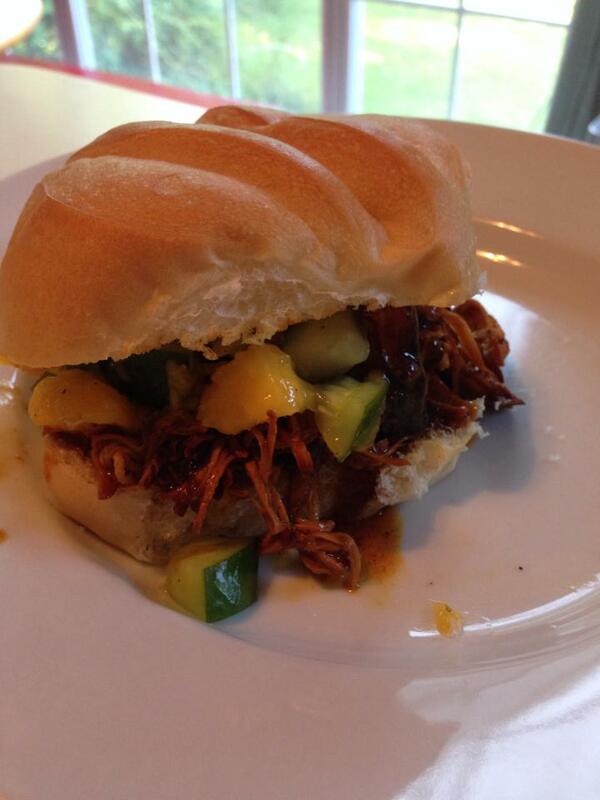 Caribbean jerk chicken sandwiches with mango-cucumber salsa that we made from the cucumbers in our garden – YUM! Until Eden is fully restored, we need reasons to practice coming together. We need opportunities to remember that we’re so much better together than we are on our own. 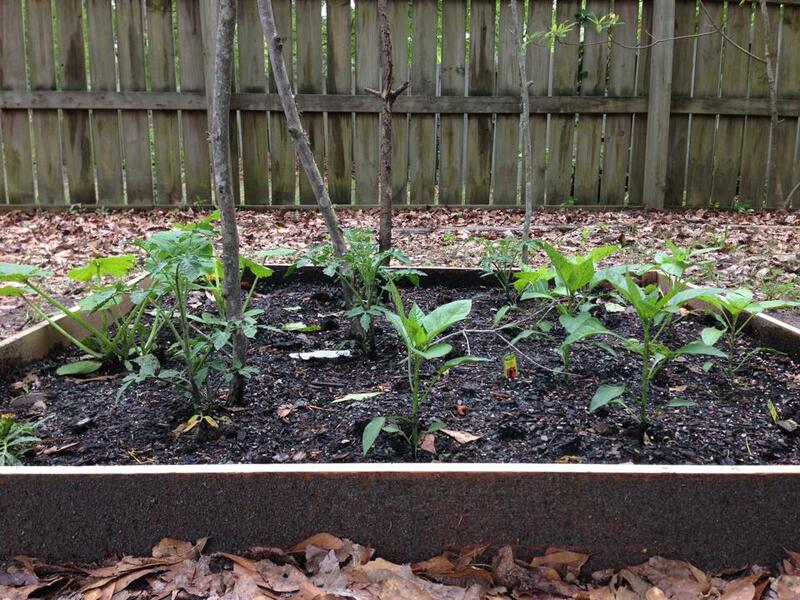 This year, I did the gardening by myself…most if it died while we were on vacation because I forgot to ask our neighbors if they would throw a little water over the fence. Lesson learned – again. We’re better together! What are you growing in this season of your life? And, more importantly, who are you growing it with?